Although I’m madly in love with Taylor Swift lyrics, this isn’t an attempt to go down the path of “Because the haters gonna hate, hate, hate, hate, hate…” (Is that enough hates? I may have missed one.). But like most Taylor Swift songs, there’s some truth there. 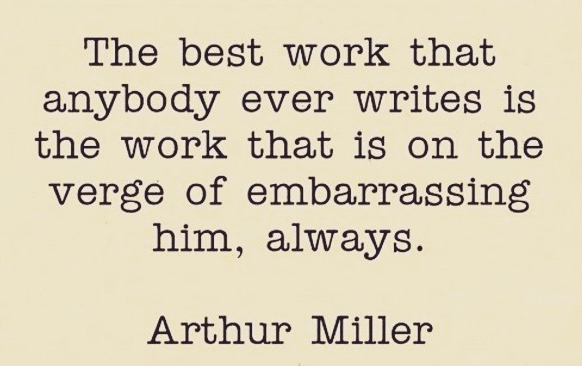 A big part of writing is accepting that you’ll have critics. But you have to remember that your critics will always be more vocal than the people who actually believe in you. The world is screwed up that way, but we all live in that world and for the most part we accept this. Trying putting anything on the internet. Anything. There will be AT LEAST one person that berates you for a spelling error (I know because I’m so guilty of this) or is completely the wrong audience and takes great offence to what you wrote or posted or created, etc. And that may be the only reaction or feedback you receive. So you’ll think it’s how everyone feels. But that’s not true. There will be others that believe in you. They will remain quiet. They will secretly take what you said or posted or created and they will use it as inspiration in their own lives. Or they’ll be lifted out of a dark place. You may never know that that’s what is happening, but it is. Is it easy to drown out the nay-sayers? No. But it’s very important to do this if you’re going to keep moving forward. And one day when you think, “I’m still crappy. I’m still creating piles of poop that no one cares about. I REALLY should just do everyone a favor and stop now.” In those darkest moments, you’ll find a glimpse of light. It will be unexpected, but it will happen. I know because this happened to me. Many times. On the other blog I write for, I stopped promoting that content on Facebook because I just felt like I was being bothersome. And then just a week ago I received a really kind note from a friend who has continued to follow the blog. I had no clue that she even read my posts. Or that she thought so highly of what I was writing. And it was that little glimpse of light that pushed me forward into blogging on this site about my actual writing. And also giving me the courage to keep posting my thoughts on the other blog. That was exactly the thought I had during a particularly tough issue I was working through just yesterday. I sat there. I listened to the criticism. Some of it was helpful feedback, some of it was not so helpful. But I held on to that moment. And it made all the difference. I hope this gives you the extra bit of courage you need. And if it doesn’t? Well then maybe you’re not the right audience for this. And that’s okay! Go find the voice that speaks to you. p.s. Every once in a while those believers will be super vocal. To the super vocal believers of mine, thank you!!! You are pushing me forward every day.